Other Immunogen Type corresponding to Homocysteine conjugated to bovine serum albumin (Glutaraldehyde). Our Abpromise guarantee covers the use of ab15154 in the following tested applications. Homocysteine is a chemical compound with the formula HSCH2CH2CH(NH2)CO2H. It is a homologue of the naturally-occurring amino acid cysteine, differing in that its side-chain contains an additional methylene (-CH2-) group before the thiol (-SH) group. Alternatively, Homocysteine can be derived from methionine by removing the latter's terminal C methyl group. Elevations of Homocysteine also occur in the rare hereditary disease homocystinuria and in methylene-tetrahydrofolate-reductase deficiency. The latter is quite common and usually goes unnoticed, although there are reports that thrombosis and cardiovascular disease occurs more often in people with elevated Homocysteine. Publishing research using ab15154? Please let us know so that we can cite the reference in this datasheet. Hcy-G-BSA, because with N-Hcy-proteins it is not active. I am currently contacting other scientists to find out more information for you. we would like to proceed with ordering the below mentioned homocysteine conjugate. Can you please advise us how to go about this. This product is now published with catalogue number ab135231. Please order the product directly from website. We would like to proceed with ordering the below mentioned honocysteine conjugate, please could you notify the relevant departments and get back to us when we can place the order? I have forwarded your request to datasheet team. I will let you know the catalogue number for ordering soon. Would like to buy the peptide used as immunogen? I can confirm that we can provide the peptide you have requested. The size is 1mg and the price would be ˜365£ for 1 vial. Could you please let me know if you are interested in buying this? I will then be asking the datasheet team for publishing this product. 1) if you've got any Ab to be used to detect protein bound Hcy, by WB. 2) whether you may recommend trying with Anti-Homocysteine antibody (ab15154), or not. I ckecked both refs: - Van Campenhout A et al. Atherosclerosis 202:557-66 (2009). (PubMed: 18602108) - Ganapathy PS et al. Invest Ophthalmol Vis Sci 50:4460-70 (2009) (PubMed: 19357353) and apparently they successfully showed protein bound Hcy, but NOT using WB. 3) I thought that perhaps ab15154 may work for detection of protein bound Hcy, unless the protein to be detected is serum albumin (I understand that the carrier was BSA), which is not my case. Thank you very much for your interest in ab15154. To our knowledge,ab15154 has not been tested in WB and we do not have any data this antibody works in WB yet. Therefore, I can offer a discount off a future purchase if you buyab15154 now, test it inWB and submit feedback to us in the form of an Abreview. It doesn’t matter whether the Abreview is positive or negative, we would just really like to receive your feedback. The discount would be to the value of: 1 free primary antibody. 1. Reply to this e-mail to let me know that you would like to proceed and test ab15154 in WB. I will then send a discount code. This code must be issued before purchasing ab15154 so please wait for my reply before ordering. 2. Purchase ab15154 either by phone, fax, or online (www.abcam.com). 3. Test it in WB. We are always pleased to obtain feedback about our products and any information is greatly appreciated! Even if ab15154 turns out to be unsuitable for WB, you will still receive the discount on your next purchase after your Abreview has been submitted. Below please find the information on how the testing discount program works. I have selected ab15154 as an example. To our knowledge, ab15154 has not been tested in sandwich ELISA. Therefore, I can offer a discount off a future purchase if you buy ab15154 now, test it in sandwich ELISA and submit feedback to us in the form of an Abreview. It doesn’t matter whether the Abreview is positive or negative, we would just really like to receive your feedback. The discount would be to the value of: 1 free PRIMARY ANTIBODY. 1. Reply to this e-mail to let me know that you would like to proceed and test ab15154 in sandwich ELISA. I will then send a discount code. This code must be issued before purchasing ab15154 so please wait for my reply before ordering. 3. Test it in sandwich ELISA. We are always pleased to obtain feedback about our products and any information is greatly appreciated! Even if ab15154 turns out to be unsuitable for sandwich ELISA, you will still receive the discount on your next purchase after your Abreview has been submitted. Thank you for your response. I have forwarded your response to our customer and they just have several more queries: From the customer - "Was the initial peptide sequence I was given (which raised my concerns in the first place) incorrect or was that the synthetic peptide mentioned in the spec sheet that is coupled to BSA via glutaraldehyde? If the latter was the case, I still don't see the connection to homocysteine. My next question is about cross reactivity against uncoupled bovine and human serum albumin. The data sheet does not mention cross reactivity against BSA alone (only coupled forms), was this tested? I don't know how immunogenic BSA is but I would have thought there is the potential for background issues here and there is no mention of adsorbing the antibody preparation against BSA on the spec sheet." Thank you for getting back to me. In response to your customer; I am sorry for the confusion. I do not know where the peptide sequence that your customer cites was sourced. 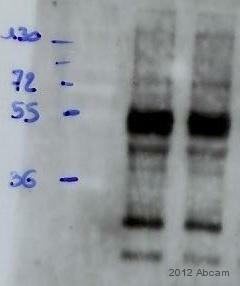 I can confirm that this antibody was raised against homocysteine-glutaraldehyde-BSA. I can also confirm that this antibody does not recognize Homocysteine alone and only recognizes homocysteine in the context of BSA-homocysteine. This antibody is sourced from an external originator. Unfortunately we do not have details of the testing of this antibody against the uncoupled form of BSA. I am sorry that I cannot be of more assistance.